The “Intro to Showy Garter e-Book” announcement in January was just the first of five (yes, five!) Showy Garter e-books, each of which illustrates a different way to use the Showy Decrease to give garter stitch a kick. It was my most ambitious effort yet, with 21-pages of tutorials and patterns. I’m in love with (and addicted to) Showy Garter and can’t wait to share more with you. This was a big turn around for me, since I really disliked traditional garter stitch. If you haven’t had a chance to download the free intro ebook in Ravelry, now’s a great time to do so because we’re about to take the next step. The next series of patterns use the contrast of the raised Showy Decrease vertical lines and the horizontal garter lines to create designs on the knit fabric. The first of these patterns is a sock weight shawl that’s perfect for warm weather knitting. It has fun color blocking, interesting construction and bold colors. I’ve knit 2 samples already and I’m diligently working on the pattern. I am struggling a bit trying to balance detailed and conceptual instructions. My concern that too much detail may make the design look difficult when it is not. I designed a swatch that mimics the flow of the lines in the shawl to test it out. As you can see, the vertical lines stop and start to create triangles. On the shawl design, these connect to form dramatic angular patterns. 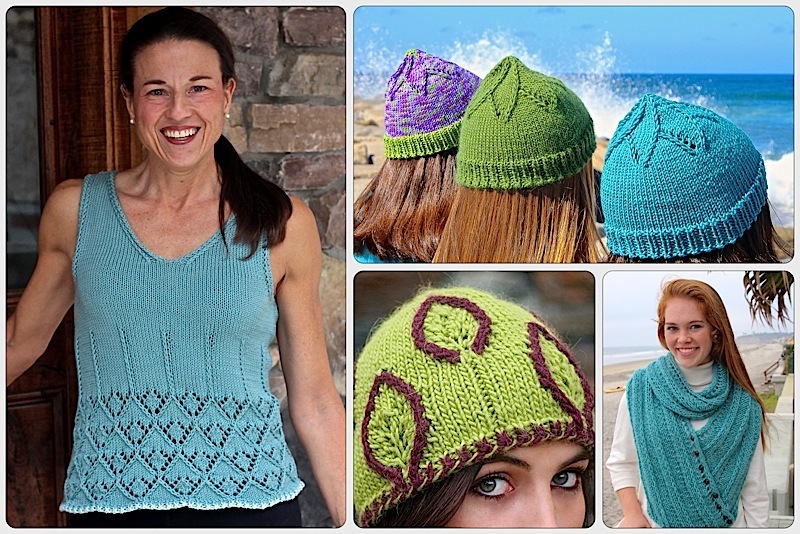 Download the free “Intro to Showy Garter e-Book” from Ravelry. There are tutorials in there that you’ll want to reference. Click on any of the 4 Showy Garter patterns listed on my designer page, the e-book has them all. If the new shawl looks too complicated, try the vertical lines dishcloth to get a feel for the idea. Find some smooth scrap yarn in two colors, about 15 yards each color. I used a cotton so I’d have a washcloth in the end. There’s more info in the swatch pattern. Let me know! The first 10 people to send me helpful feedback and a photo of their swatch get a Ravelry coupon code for any of our patterns. You can comment here on the blog and/or send me an email at laura@knittingnuances.com. I can’t wait to get this shawl published. I think you’re really going to like it. Do you think a shadow knit design can be made using the showy garter stitch? Yes, I do think it has fun possibilities. Even with just one color the raised vertical lines really stand out. I’ve been planning on trying it and have just not decided on the image to create. If you have any ideas I’d love to try it. What is YOR? The same as yarn over? Yarn in front before or after slip 1? or is it a regular yarn to the front to purl the next stitch? The purpose of yarning over in reverse is so that you do not have to purl through the back loop to close it on the next wrong side row. I find that the most awkward stitch ever. The pattern gives alternatives like a make 1 loop or reorienting a standard yarn over on the next row before purling it. It all depends on how you knit and what is most comfortable for you. Laura (again). or sl, wyin P Where should the comma be? The comma is confusing. Which pattern do you consider the main pattern? This is just a mini test of the shawl pattern that is coming. It is also part 2 of an e-book series. The Into to Showy Garter knitting is in Ravelry and has pages of tutorials. Now I realize I will need to repeat some of those tutorials in every e-book to make it easier for knitters new to the idea. We’ve been talking about the Showy Decrease here on the blog for almost 2 years, but that doesn’t help new readers so I need to be ore diligent at providing background info. I’m learning a lot from the comments and emails so far. Thanks all. As a teacher, I love that this is a way to take “simple garter stitch” work to a more exciting variation! As a creator, I can see an enormous variety of design possibilities with this technique! I have been playing with cables quite a bit, and like the way the Showy Decreases create bas relief . As a knitter, I see that garter will never be “just plain old garter” ever again! Thank you for sharing your innovations with us! I would like to see the Start/ Continue / End color cues bolder or having more contrast. On my preferred device, Samsung Galaxy Tab 4, the colors are muted and difficult to differentiate on the screen. Thanks for the great comment. I love the contest of the squat garter stitch and the raised Showy Decrease. There are 5 e-books in the works because I’ve already thought of 5 different ways to combine them! I just want to knit and write patterns 24 hours a day. In Row 3 do we slip the stitch as if to knit or purl? Love your designs. Very exciting! I wish your classes were recorded and published on YouTube. I’ve watched all of those that are but need more. I’ve started doing them for new projects and will try to get back to older ones. Im focusing on adding the technique videos now. You Tube is killing me. I added 8 videos, got the number of followers they require to start my channel, but now the original videos don’t show on my channel. Ugh, am I am very techy. Will continue to try to sort it all out. This entry was posted on May 28, 2017 by Laura Cunitz in Free Downloads, Nuances, Patterns, Scarves, Showy Garter.